Over time swimming pools need upgrades. We are happy to respond to your needs and upgrade your pool to the backyard oasis you desire. In need of tablets, salt, a new vacuum, or a few new pool toys? Our store has all of the items you need to keep your pool at peak performance. What you can imagine, we can create! We are a family owned and operated full service swimming pool builder and construction service. With 30 years experience, we know how to make dreams come true. Just take a look at a few of the amazing backyard transformations we have completed. 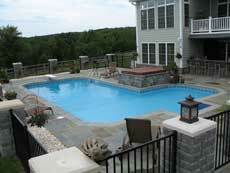 "We are thrilled to have taken our time during our pool builder search. Mike presented everything very honestly to us, which wasn't the case with many of the other guys. We can't say enough about Laurel Pools and how satisfied we are." A lifetime of vacations in your own backyard!